A big ol’ party celebrating music from Eastern Kentucky is set to happen this Friday and Saturday in the heart of Louisvile’s urban, Clifton neighborhood. 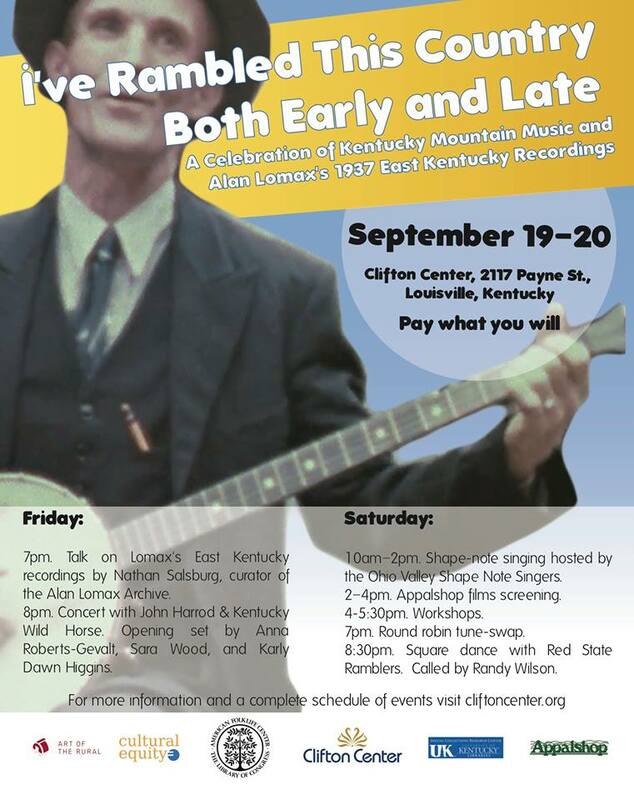 The two-day festival, called “I’ve Rambled This Country Both Early & Late: A Celebration of Kentucky Mountain Music,” is the kick-off to a series of repatriation events, reintroducing the digitized recordings from folklorist Alan Lomax’s recording sessions in the ’30s to various cultural institutions and libraries where they can be accessed by researchers, musicians and fans of mountain music. The event’s title references a song collected and recorded by Lomax from the early 20th century, in Salyersville in Magoffin County in southeastern Kentucky. The Lomax’s recordings that are coming home to roost this weekend are part of Lomax’s 1937 two-month documentation stint in which he garnered 32 hours of recordings from “ballad singers and songsters; Baptist, Methodist, and Pentecostal hymns; children’s game songs and lullabies; and dozens of fiddlers, guitarists, harp-blowers, and banjo players … [and] farmers, coal miners, bus drivers, washerwomen, and schoolteachers,” as described in event materials. The event is organized by Nathan Salsburg, a curator with the Alan Lomax Archive who lives in Louisville and is managing the efforts to repatriate the recordings throughout Kentucky. “The Louisville event is the kick-off what will be a year-plus of statewide repatriation events,” Salsburg says. Through these events, the Alan Lomax Archive, Salsburg continues, “in collaboration with partners across the state, and the American Folklife Center at the Library of Congress—will be making Lomax’s 1930s East Kentucky recordings available to institutions and organizations large and small, and to the communities where they originated.” According to Salsburg, the Lomax Archives plans for them all to be available online by the end of 2015. The weekend’s events honor the music of eastern Kentucky through cross-genre events including film screenings, a square dance, a curator’s talk on Lomax’s recordings, as well as a Friday night performance of traditional Appalachian music. There will also be a shape-note singing session with the Ohio Valley Shape Note Singers and musician-led workshops in banjo, fiddle and crankies. According to this story from WUNC, crankies are “long swaths of decorated fabric or paper rolled up on both ends like a scroll. The scroll is installed in a box, and a storyteller uses it by slowly cranking the scroll as they relate a narrative, so that one part of the scroll (or one scene from the story) is visible in the frame at a time.” Musician Anna Roberts-Gevalt, who sings traditional music and creates crankies, will lead the workshop. All events take place at the Clifton Center (2117 Payne Street, Louisville) and entry fee is pay-what-you-can. ← You say App-uh-latch-un, and this t-shirt does too.